Pulse is an iPad app that collects multiple sources of your favorite news feeds and displays them in a convenient and attractive way to create a highly enjoyable reading experience. News sources you select are arranged as a stream. Just drag the screen vertically to scan all your sources, then drag it horizontally to view particular articles within each source. Tap the screen to read an article in text view or view it as a full webpage. 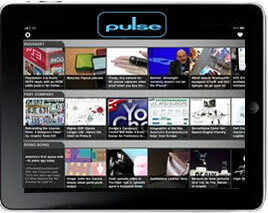 Pulse will even collect and display your Twitter stream. Sharing is as easy as a couple of taps. To get a glimpse of what Pulse can do, please watch the video below and try Pulse for yourself, available from the iTunes store. 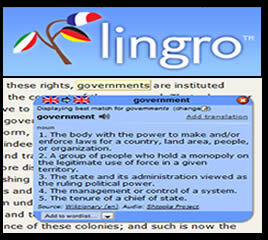 VocabGrabber is a Cool Tool that makes it easy to generate vocabulary lists from digital text. Just copy and paste text into a box and watch the tool generate a word cloud in which the most frequently used words appear larger in size. Those words are sorted into categories so users can extract specific content-related words from the cloud, or generate a general vocabulary list. Clicking on a word displays a definition, examples from context and a visual word map generated through the company’s Visual Thesaurus Tool. Be sure to use the handy toolbar add-on for maximum efficiency when you try VocabGrabber for yourself. As a tech facilitator much of my success can be attributed to what I learn through the contacts I’ve made via my Personal Learning Network. Summer is a great time for educators to begin to build a personal learning network and so I’ve decided to simultaneously introduce a new tool for collaboration and try an experiment to demonstrate the power of a PLN. If you have received a personal invitation to view this blog through Twitter, that means your blog has been published on the online bulletin board of Good EdTech Blogs I created using a user-friendly post-it note tool called Lino It. I am asking you to give the tool a try and add your favorite edtech blog to the bulletin board, then send a Tweet to the author with an invitation to contribute and continue the process. If successful, I think this bulletin board will grow rapidly and demonstrate the power of a PLN in addition to creating a great list of resources for those who are just starting to build a PLN. If you just happen to be reading this blog, please join us. You can post your own edtech blog, or your favorite, then do spread the word. Lino It is a tool for creating a bulletin board of online sticky notes and a good tool for teachers to try this summer for collaborating with team members as you reflect and think about ideas for the upcoming school year. Working on a project? Collecting resources for a unit of study? Why not start with this simple and easy-to-use bulletin board. You can set up an account for free and share your bulletin board with a target group or make it public and share it with the world. Stay tuned to this blog this summer as I continue to focus on ways to help educators develop a personal learning network.